Estimating that illegal mining in Odisha is larger than that of Karnataka and Goa put together, Congress leaders from the state, including Union Minister Srikant Jena, today demanded resignation of the Chief Minister Naveen Patnaik and immediate cancellation of licences by firms resorting to illegal mining. 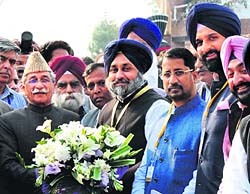 Amid high hopes of strengthening economic ties between the two Punjabs, a 45-member delegation led by Punjab Deputy Chief Minister Sukhbir Singh Badal crossed over to Pakistan today via the Attari-Wagah land route. In an attempt to mount pressure on the RSS to deny a second term to BJP president Nitin Gadkari, noted lawyer Mahesh Jethmalani today resigned from the party�s national executive to protest against his continuation as the party chief. Amid a raging debate over providing security to around 33,000 elected panchayat members in the wake of a fresh threat by Hizbul Mujahideen chief Sayed Salah-ud-Din, Chief Minister Omar Abdullah today said it was not necessary to provide personal protection to each and every panch and sarpanch in the state. The announcement of the 15-member squad for the first two Tests against England starting November 15 has brought happy tidings for the Punjab duo of Yuvraj Singh and Harbhajan Singh as they made it to the squad after a gap of over one year. An Indian was killed and another injured as five explosions rocked parts of Bahrain�s capital Manama today, also claiming the life of another Asian, as the country grappled with growing political and ethnic unrest. Cong workers get a free ride through toll plazas, but at whose cost? A Congress flag or a Congress leader�s poster � that was all it took for a free run on the National Highway No. 21 between Chandigarh and Delhi as the toll gates were thrown open to �vehicles pasted with Congress posters� yesterday.